DA Form 4005 - also known as the "Automatic Sprinkler And Standpipe Equipments Inspections And Tests" - is a Military form issued and used by the United States Department of the Army. The form - often mistakenly referred to as the DD form 4005 - was last revised on January 1, 1973. Download an up-to-date fillable PDF version of the DA 4005 below or request a copy through the chain of command. 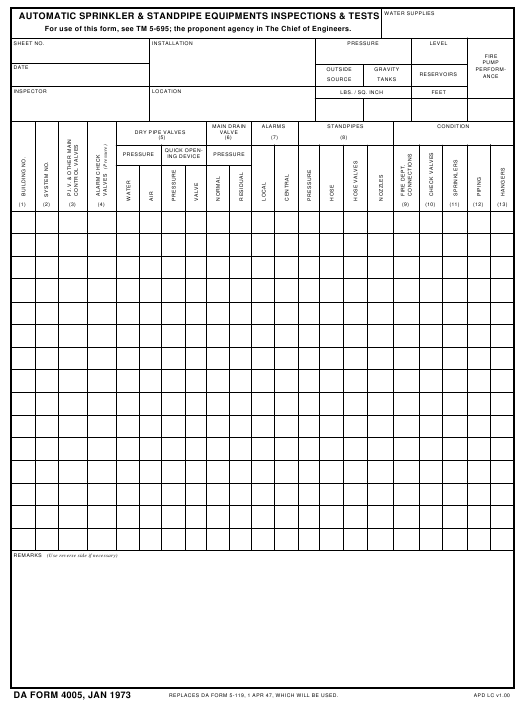 For use of this form, see TM 5-695; the proponent agency in The Chief of Engineers. REPLACES DA FORM 5-119, 1 APR 47, WHICH WILL BE USED.